Shopify was founded in 2006. In 2014, Shopify powers over 120,000 online retailers, the platform lets users easily and quickly create their own online store, without all the technical work involved in developing their own website, or the huge expense of having someone else build it. Merchants can use Shopify to manage all aspects of their shops: uploading products, customizing the design, accepting credit cards, and viewing their incoming orders and completed transactions. 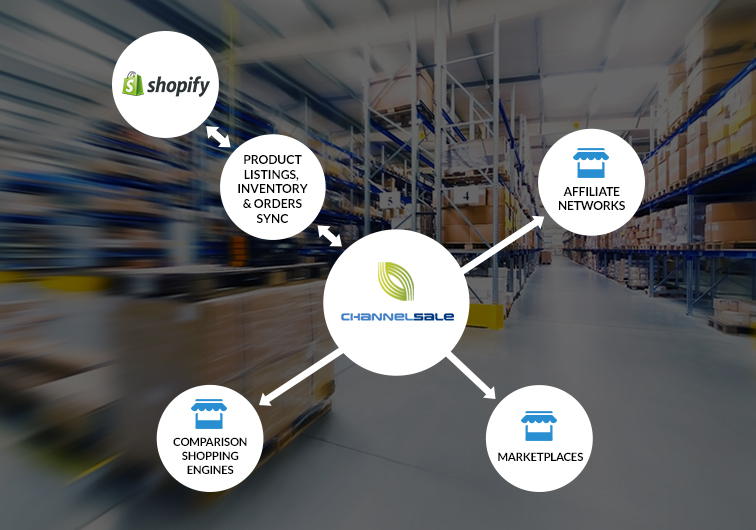 ChannelSale’s pre-compatible integration with Shopify can help you reap the rewards out of this web store solution. Are you an Shopify seller in need of promoting your business effectively across multiple shopping sites? From top online Marketplaces like Amazon, eBay, Walmart, Sears, Rakuten, Newegg, Wayfair, Overstock, etc., To Comparison Shopping Engines like Google Shopping, Nextag, PriceGrabber, Shopzilla, To Affiliate Networks Commission Junction, Share A Sale, Link Share - integrate with these big names by putting your trust on ChannelSale. Hire our Shopify walmart plugin services at affordable rates. Get 2 comparison shopping engines Sort Price, Bing Shopping setup costing $198 for free with Shopify plugin integration with no recurring fee for first month, followed by $149 per month for upto 10k sku’s, add $20 per month for next additional 5k sku’s. Supports multiple Shopify stores to list products, update inventory – all managed through single interface of ChannelSale. 2 ways integration via Shopify API (Application Programming Interface), means you can automatically bulk list products on Shopify via ChannelSale or the other way around that is ChannelSale can retrieve your product listings from Shopify and further synchronize them across all the top online marketplaces, comparison shopping engines and affiliate networks. Real time inventory updates from / to Shopify plugin – avoids over-selling and under-selling issues. For example - If a product sells on Amazon, the updated remaining quantity in hand would reflect in your ChannelSale account and further on Shopify. Centrally manage all orders. Export Shopify orders to third party order fulfillment platforms / dropshipper’s, Fulfilled by Amazon, or to suppliers.